Relic Lore is currently divided into 7 regions: Snowmarch Expanse, Northern and Southern Eden, the Heart of Relic Lore, Serpent's Pass, Vale of Secret's and The Deep Forest. Each of these territories have their own distinct characteristics and territories within them, which you can read more about on the IC forums and the sub-territory article within the Library. It is within these territories that a wolf pack would claim a den for the sole use of their pack, and the locations of each pack's den can be viewed on the Map of Relic Lore. Individual character dens, such as those of lone wolves, are not marked. They do however exist throughout Relic Lore and their rough location can be viewed in the character profiles. 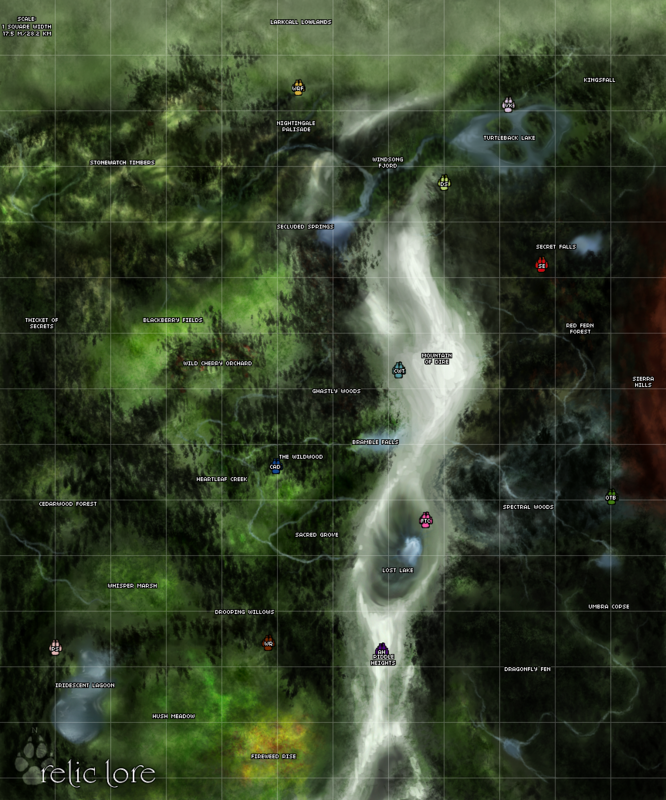 Relic Lore is divided into a 'east and west' scenario by Serpent's Pass, which snakes through from the north to the southern parts of the forest. To reach the other side of Relic Lore you have to cross the Pass, which is a treacherous and rocky terrain. Many younger and elder wolves may not be able to manage the journey. Traveling over the Pass will most likely take a few days, and therefore is a very difficult journey even for wolves in their prime. The western side of the Pass is mainly taken up by the northern and southern Eden regions, where lush meadows and strong trees prevail, making it clear why the name 'Eden' was chosen. However, acting like the centerpiece of western Relic Lore, the Heart is located here, supplying the west with the strong Wildwood forest. Over the Pass on the eastern side of Relic Lore lies the Vale of Secrets and The Deep Forest. The Vale, as its name suggests, is steeped in mystery and its location is almost impossible to find if a wolf has not been led their personally or given directions, which is why those who seek it must first find a wolf who knows where it is. Finally, located at the south eastern part of Relic Lore is The Deep Forest, the most unexplored and unknown terrain in the Forest. While traveling through the various regions of Relic Lore it is important that you are aware of RoW's 'realistic travel' rule. This is simply that you take into account the size of Relic Lore, so, for example, your wolf could not be in Northern Eden at one minute and then Valley of Secret's without roughly 5 days passing in character time. While OoC you could have threads taking place in both regions your wolf needs to be aware that the correct amount of time has passed in their 'timeline'. So, for example, as a member of a pack your wolf could not go missing for 10 days to travel to the Vale and back without the leader's permission - or if they do, at least be aware of the consequences. To help you keep track and to make it as easy as possible when judging the time it would take to travel around Relic Lore a table has been devised below. Of course the length of time taken is dependent on the wolf and speed of travel, but this is based of a fit adult wolf traveling at a casual lope, which is a type of movement wolves can maintain steadily for hours. The distance is also judged traveling from the center of one region (e.g. Blackberry Fields in N. Eden) to the center of another (e.g. 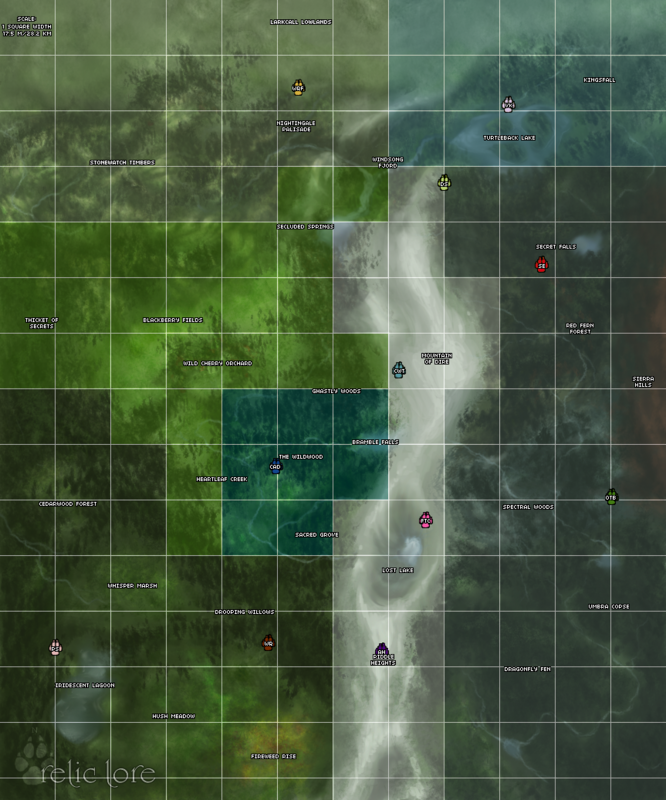 Hush Meadow in S. Eden), which you can check by using the map. DISCLAIMER: Units of time (Days) have been rounded to the nearest whole number. Some trips may actually be longer or shorter. 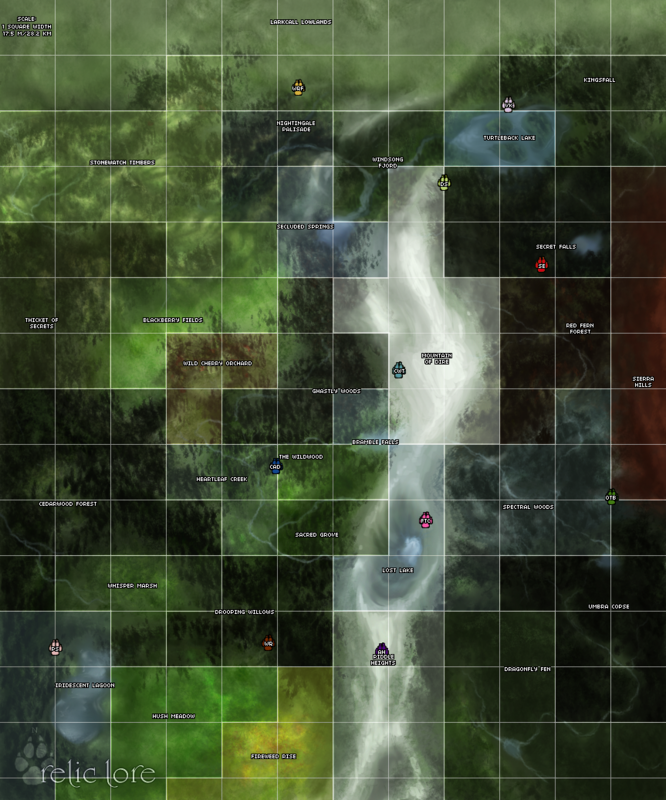 For those of you who are interested in the nitty-gritty details of travel and distance, below you will find some maps that will illuminate the scale of the map. Relic Lore is roughly 210 miles or 338 km from east to west, which would take a wolf about a week to travel across. Please note that these numbers are approximated based on squares. The actualy territories themselves are not squares.